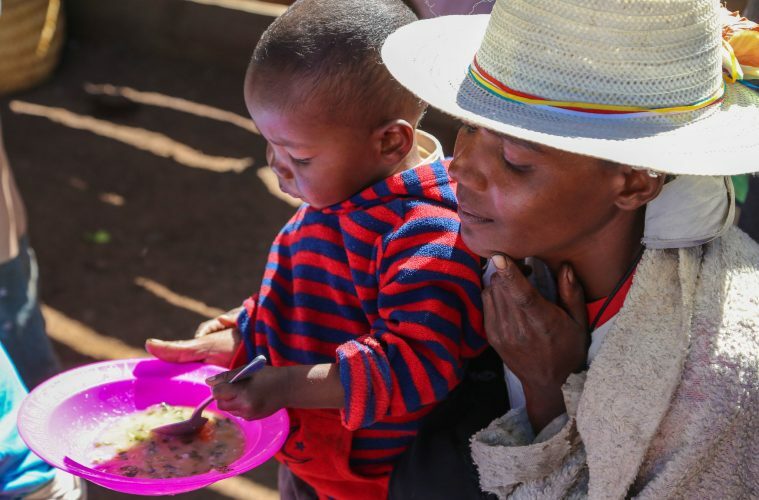 A young mother and her baby visit the local nutrition center in rural Madagascar to participate in a discussion around children’s nutrition and learn new cooking recipes that promote a varied diet. Photo: Mohamad Al-Arief/The World Bank. Persistent humanitarian crises caused by natural and man-made disasters, oppression and other emergencies have plagued our world as long as time itself. And while global relief organizations scramble to respond to these events, their work by definition is often reactive and difficult to scale. We believe that technology, like artificial intelligence (AI) combined with cloud technology, can be a game changer, helping save more lives, alleviate suffering and restore human dignity by changing the way frontline relief organizations anticipate, predict and better target response efforts. Today, in conjunction with the United Nations General Assembly meeting, we are announcing AI for Humanitarian Action, a new $40 million,five-year Microsoft program. The initiative will harness the power of AI to focus on four priorities – helping the world recover from disasters, addressing the needs of children, protecting refugees and displaced people, and promoting respect for human rights. Our AI for Humanitarian Action program is part of Microsoft’s AI for Good suite – a growing $115 million, five-year commitment to work to unlock solutions to some of society’s biggest challenges with artificial intelligence. Modeled after our AI for Earth and AI for Accessibility initiatives, we will work deeply with selected nongovernmental organizations (NGO)s and humanitarian organizations through financial grants, technology investments and partnerships that combine our AI and data science know-how with these groups’ core expertise. We are optimistic that AI for Humanitarian Action will accelerate the pace of innovation by managing strategic AI projects that demonstrate new applications, delivering reusable solutions and partnering with others to expand and scale initial projects. Disaster response. It seems that no corner of the planet is immune to the devastating consequences of natural disasters, whether they be fires, drought or storms. Artificial intelligence and data modeling hold huge promise for forecasting and detecting early signs of coming disasters, and also can help responders better target their aid. AI technologies like machine vision can quickly analyze images of roads damaged or destroyed by an event, making way for a faster and safer response. In a new partnership with the World Bank, United Nations and partners from the tech industry, relief organizations will be better able to predict when and where future famines will occur so aid can arrive earlier, potentially saving more lives. Needs of children. We believe AI can equip NGOs and organizations with better tools to protect the world’s most vulnerable population: children. Human trafficking, for instance, is one of the world largest criminal industries, ensnaring millions of children each year. Already we are using predictive analytics and bot frameworks to target both the supply and demand underpinning human trafficking – ultimately disrupting criminals and bringing relief to victims around the world. Basic health services for children are also in critical need around the world. Our longtime NGO partner, Operation Smile, uses machine vision AI and facial modeling to improve the organization’s surgical outcomes and help more children in need of facial surgeries. Sudden infant death syndrome (SIDS) is another issue where advanced technology can help. Each year thousands of babies die, yet the root causes of SIDS are not yet fully understood. Microsoft is collaborating with the Integrative Brain Research Institute of Seattle Children’s Hospital and some of the top medical researchers worldwide using AI and machine learning to develop the first-ever genomics database focused on SIDS to provide new insights to identify the causes of, and put an end to, SIDS worldwide. Refugees and displaced people. The number of refugees and displaced people in the world are at a record high, and this is a seminal challenge of our generation. AI and machine learning have the potential to improve the lives of approximately 68 million displaced people in the world, 28 million of whom are refugees. AI can help optimize the delivery of aid, supplies and services to refugees and can scale NGOs’ efforts to communicate and understand displaced peoples’ needs. Microsoft is working already with the Norwegian Refugee Council, NetHope and University College Dublin to develop a chatbot using AI technologies, such as language understanding, machine translation and speech recognition to intelligently assist displaced youth to connect them with free, high-quality educational resources. Using chatbots like this could also provide a model for aid workers in the field. It could help these workers communicate with displaced people who speak different languages and who need specific core services like access to food, health care and shelter. Human rights. We will collaborate with NGOs and humanitarian organizations to accelerate breakthrough solutions to help monitor, detect and prevent human rights abuses. Deep learning has created the ability to better predict, analyze and respond to critical human rights situations. Utilizing AI-powered speech translation, people can connect with pro bono lawyers who are protecting people’s human rights. A fundamental aspect of all our AI for Good initiatives is to combine Microsoft’s technology and expertise in artificial intelligence and data science with the talent and expertise of groups around the world in fields such as environmental science, disability needs and humanitarian assistance. As we continue to grow our efforts in all of these areas, we are assembling a new team within Microsoft of top-flight data scientists and analysts. To lead these efforts, John Kahan will join as the Chief Data Analytics Officer for Microsoft’s Corporate, External and Legal Affairs, reporting directly to me. John’s team will have an ambitious mission – to derive new insights and infuse data science to address the world’s great challenges. This will include promoting the sustainable use of the planet’s resources, improving opportunities for people with disabilities, protecting human rights, strengthening humanitarian assistance and increasing the capabilities of the world’s NGOs. For over 15 years, John has been one of the key leaders driving Microsoft’s big data strategy and work. He has over 33 years of experience driving large-scale data and world-class data science teams. I could not be more excited about the future contributions this team has the opportunity to pursue. We are hopeful the world will see what a compelling force for good AI can be when it’s used well in partnership with innovative NGOs. By ensuring technology fulfills its promise to address the broadest societal needs, we can empower everyone to achieve more.